The Chickenhawk Syndrome is a somewhat derogatory term used in American politics to describe a person who strongly supports war or other military action, yet who actively avoids or has avoided military service themselves or kept their children out of harms way by favourably treating them. In political usage chickenhawk is a compound of chicken (meaning coward) and hawk (meaning someone who advocates war). Generally, the implication is that chickenhawks lack the moral character to participate in war themselves, preferring to ask others to support, fight and perhaps die in an armed conflict. 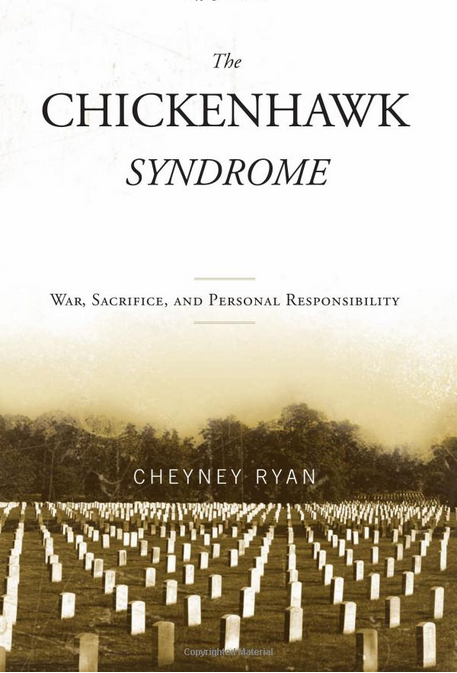 Chickenhawk Syndrome indicates that the person in question is hypocritical for personally dodging a draft or otherwise shirking their duty to their country during the time of armed conflict while advocating that others should go and fight. A famous example of a chickenhawk was president George W. Bush II. At the time when thousands of young men were risking their lives in the jungle of Vietnam, Bush was given a cushy commission. In May 1968, he was commissioned into the Texas Air National Guard. After two years of active-duty service while training, he was assigned to Houston, flying Convair F-102s with the 147th Reconnaissance Wing out of the Ellington Field Joint Reserve Base (USA). Yet, when president he did not hesitate to 'lead' his country and thus soldiers into war.